We’re delighted to introduce our newest fabric; the perfect blend of cotton and linen. Our Washed Cotton comes in a selection of six faded shades. Soft, yet beautifully textured, the subtle tone differences in the weave give this fabric rustic elegance. When you’re buying a new sofa, the fabric you choose is just as important as the sofa shape. Looking for pared-back colour that’s soft to the touch and will give your sofa a casual, laid back look? Washed Cotton ticks all the boxes! The six subtle shades that make up our Washed Cotton collection have all been inspired by nature. We’ve chosen understated hues, all which have soft grey undertones. Unlike some cottons and linens, these fabrics are not a plain, flat colour; it’s the subtle variations in depth of tone that give the Washed Cotton it’s coveted lived-in look. Want to check out the range in your own home? You can order up 8 fabric swatches for free. A fabric sofa is a great choice for a family home. When you’re searching for the perfect family sofa, comfort is key; the soft texture of our Washed Cotton is tactile and inviting. Paloma, shown here in our Chiswick Store, is upholstered in Nordic Dusk. The subtle blue/purple colour is a perfect match for Paloma's casual shape. The seat and back cushions are foam wrapped with a layer of feathers (plump them regularly throughout the week to avoid flattening), meaning that soft, squidgy coziness and laid-back style is a given. To complete the relaxed look for your lounge, we’d recommend a pile of our feather-filled cushions in complementary shades and a neutral rug to bring warmth and texture. Add the finishing touch of easy-to-care for houseplants such as rubber plants or succulents. You don’t have to choose a modern sofa shape to give your lounge a casual vibe. Even our more classically inspired sofas will look great upholstered in Washed Cotton. The modern twist that this relaxed fabric gives sofas such as Phoebe and Rose, will give your lounge a lovely, laid-back feel more than traditional or formal fabrics would. 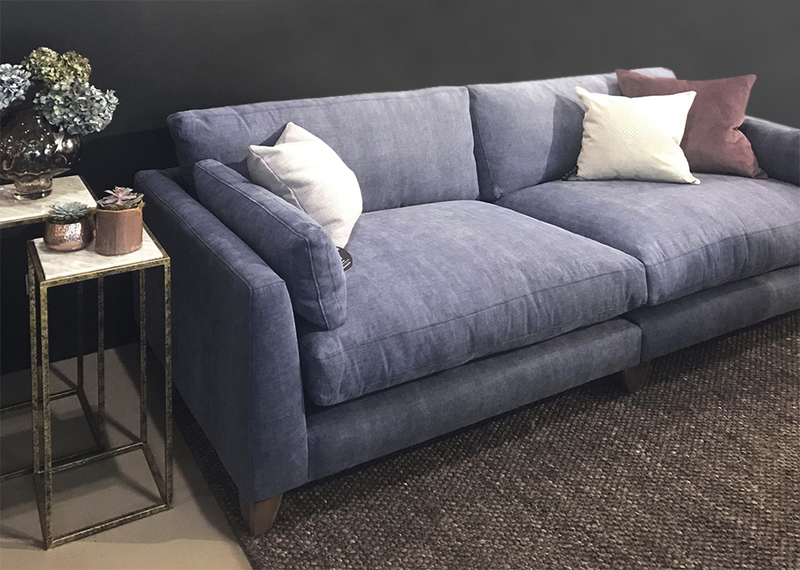 If your home has a more modern look, then our more contemporary, casual sofas such as Paloma and Sophia are perfect shapes to be clad in Washed Cotton. The only issue? Getting the family off the sofa and out of the house! Like the sound of Washed Cotton? Order a fabric sample now or visit one of our 21 galleries to choose your favourite sofa shape. Your new sofa will be handmade in the UK and delivered for free in just 6 weeks; get ready for some laid-back living!